A chic and elegant half-moon nail art tutorial. Learn how to get this simple nail look step by step with our DIY guide. In my last post, I created a cute and fun cloud-inspired nail art look that was perfect for summer, and this week I wanted to show you how to make a more elegant design. This half-oval manicure looks sophisticated and classy, which makes it an excellent choice for a night out on the town or any fancy occasion. 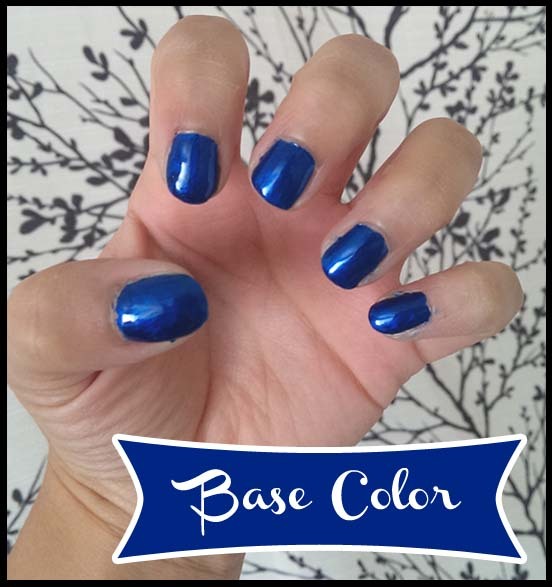 As my base color, I chose a rich blue, like Sally Hansen’s Extreme Wear in “Blue It”, but of course, you can use whatever nail polish color you prefer. Then, with a pigmented black polish, I simply made a stroke starting a little higher than the middle of my nail. 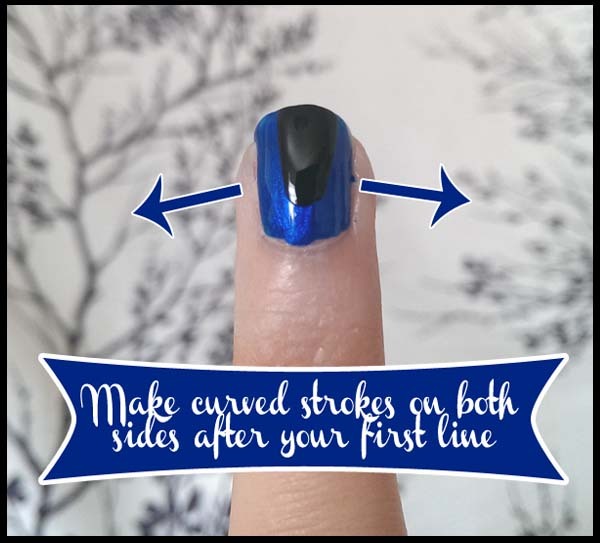 After this, go back and make curves on either side to create a nice, half oval shape on the nail. Uh, can I just mention that we’re basically almost done at this point? Like I said, this tutorial is super simple! 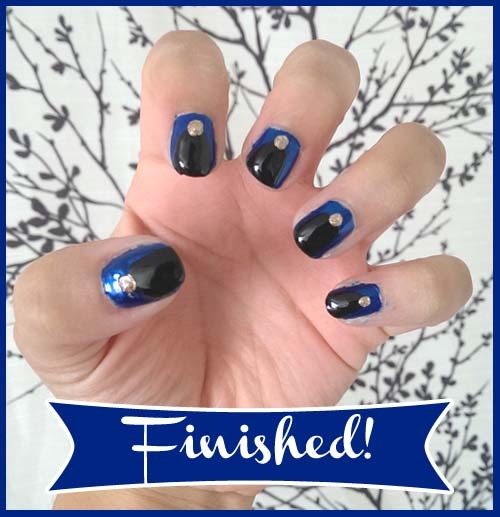 To finish this nail art look, use a gold nail polish to paint a large dot right where the black and blue polishes meet. If you don’t have a gold polish, silver looks just as gorgeous! Can You Believe We’re Done?! That’s all there is to it! In only four steps, you have a chic and elegant design that’s guaranteed to add class to any look. The best part? 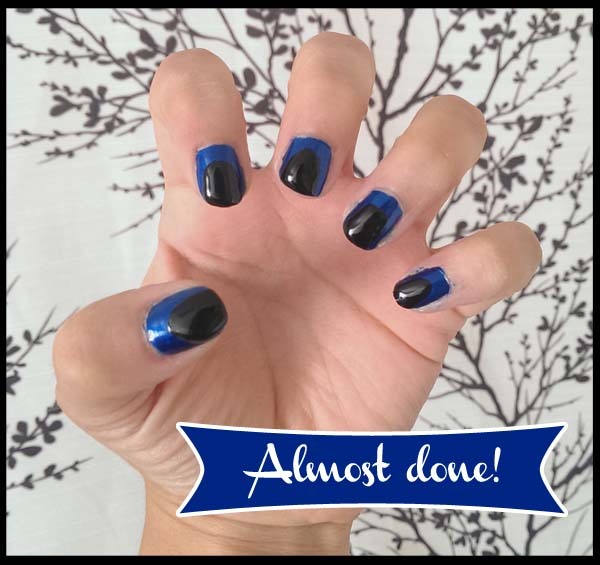 This nail art is so versatile – just switch up the colors to create an entirely different look. What did you think of this nail art? Would you wear this stylish design? Or do you prefer a cute and fun nail art look? What other colors would you use with this design? Let us know in the comments below!